Chautauqua Woods can design an entry specifically for your home using one of our standard designs or taking your ideas and transformtting them into a magnificent entryway. We offer this service at a modest fee. When you place your order, the design fee will be applied to the cost of your entry. Allow our designers and engineers to create a Chautauqua Woods first and lasting impression, and be the welcoming statement on your dream home. Welcome to Chatauqua Woods. 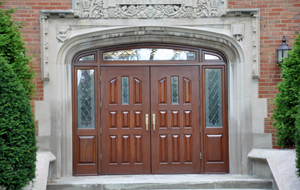 A Chautauqua Woods entry creates a first, as well as a lasting impression, that is unequaled in the door industry. In our facility, bordered by Lake Erie and the Allegheny forest, the wood is hand selected for every door. Each door is handcrafted, hand detailed and completed with a hand rubbed finish. Quality of materials, craftsmanship and the value of the finished product puts Chautauqua Woods in a class of its own. Chautauqua Woods is not just a door company, but a team of talented people that create pieces of art out of love for their craft. Made in the USA by American Craftspersons!